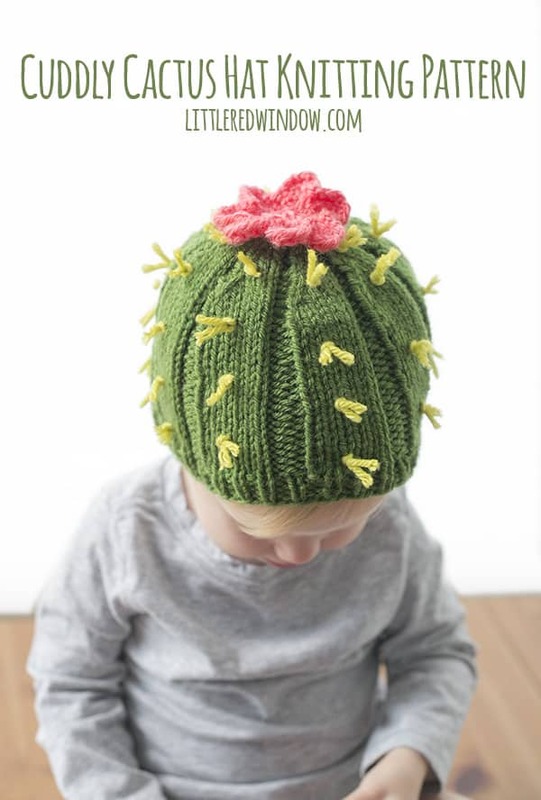 Don’t worry, this cute little cactus hat knitting pattern is cuddly, not sharp! 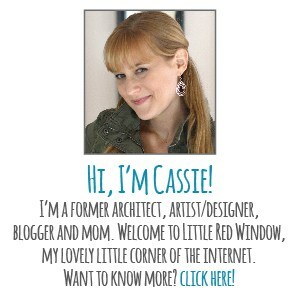 Make one for your newborn, baby or toddler today! 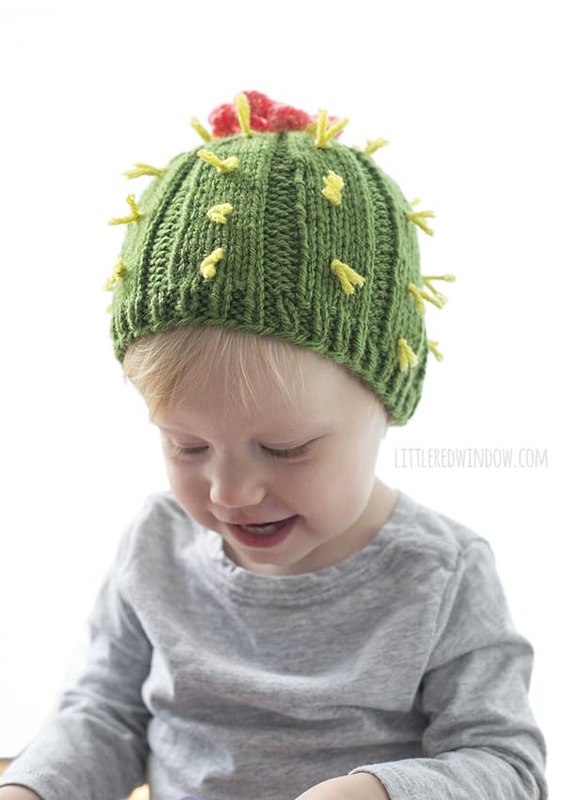 Ok, you guys, this cactus hat just seriously cracks me up, it’s SO cute! Cacti and succulents are so popular right now and rightfully so since they’re so pretty and easy to take care of! 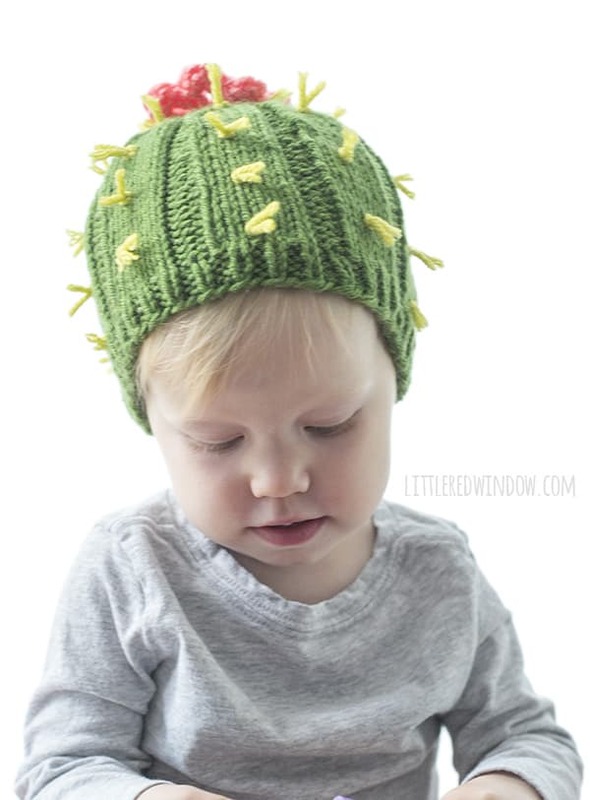 I’ve certainly done some crafting with them myself including a fun faux succulent, and a cactus ring holder, but then one day I thought about how cute a little cactus hat would be and I got to work on it the next morning. I was so excited. And it came out even better than I imagined! It turned out looking just like a cute little barrel cactus! And then AA insisted I add a flower on top, like a blooming cactus and there you go, adorable and cuddly cactus hat! 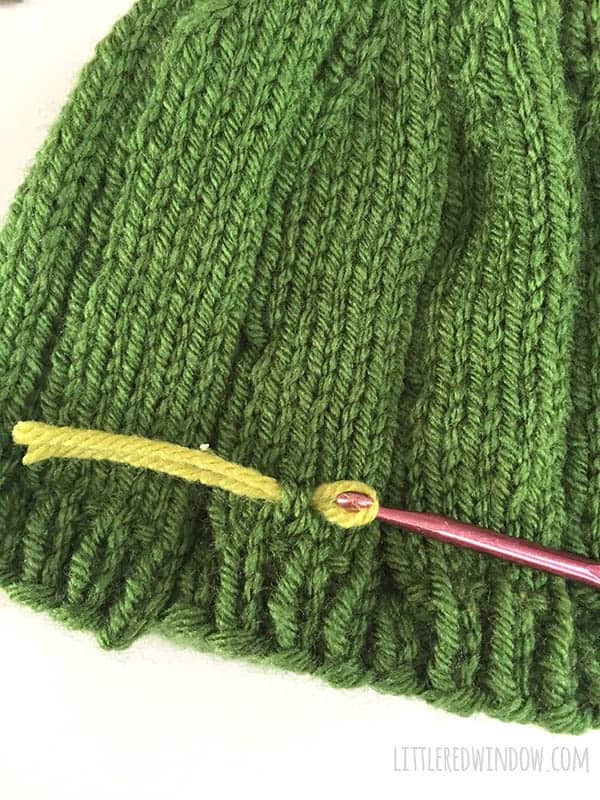 Using a long-tail cast on, cast on 72 stitches on your circular needles in your main green color. 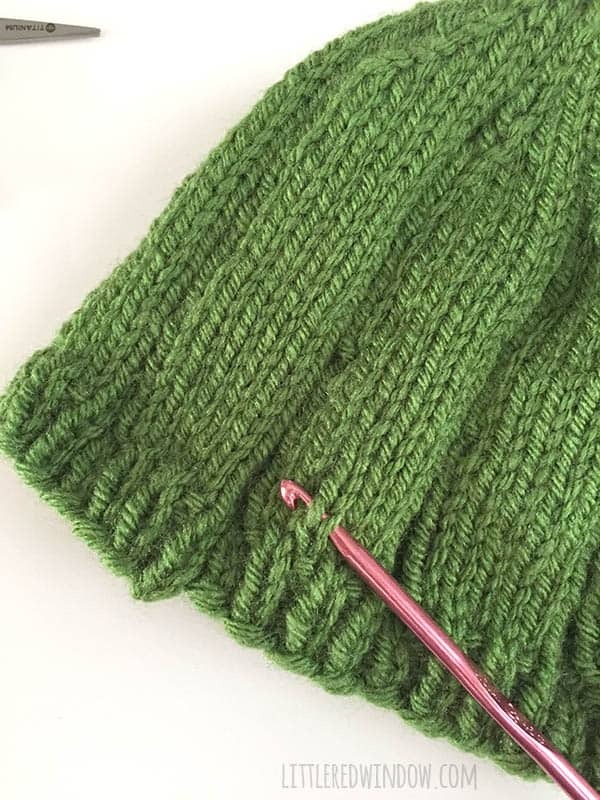 Join to knit in the round and (k1, p1) in a rib stitch for 4 rounds. Then (k6, p2) and repeat in a wider rib stitch for all rounds until the hat is about 5 inches long. Round 1: (k4, k2tog, p2) and repeat to the end of the round. Round 2: (k5, p2) and repeat to the end of the round. Round 3: (k3, k2tog, p2) and repeat to the end of the round. Round 4: (k4, p2) and repeat to the end of the round. Round 5: (k4, p2tog) repeat to the end of the round. Round 6: (k4, p1) and repeat to the end of the round. Round 7: (k2, k2tog, p1) and repeat to the end of the round. Round 8: (k3, p1) and repeat to the end of the round. Round 9: (k1, k2tog, p1) and repeat to the end of the round. Round 10: (k2, p1) and repeat to the end of the round. Round 11: (k2tog, p1) and repeat to the end of the round. Round 12: k2tog and repeat to the end of the round. Cut a pile of approx. 4 inch lengths of the light green yarn. I used about 40 for the 12 month size hat. To add a spike, insert the crochet hook under one stitch in the middle of one of the knit ribs of the cactus. 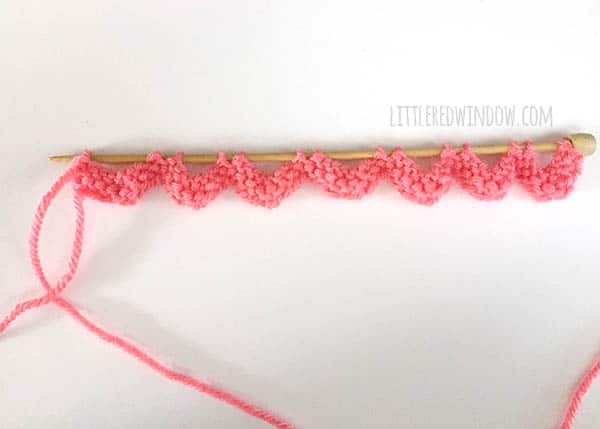 Fold one of your short yarn pieces in half and pull it halfway through with the crochet hook. 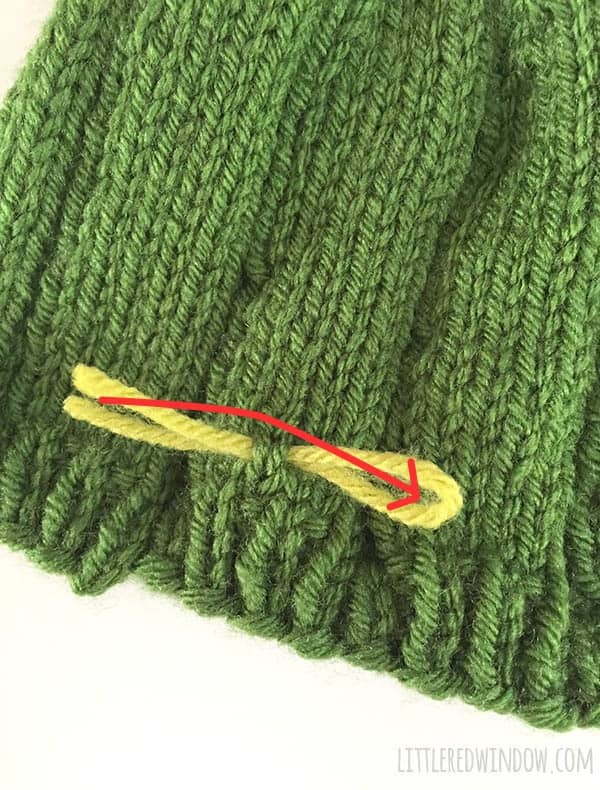 Then pull the two ends through the loop on the other side and pull to tighten. 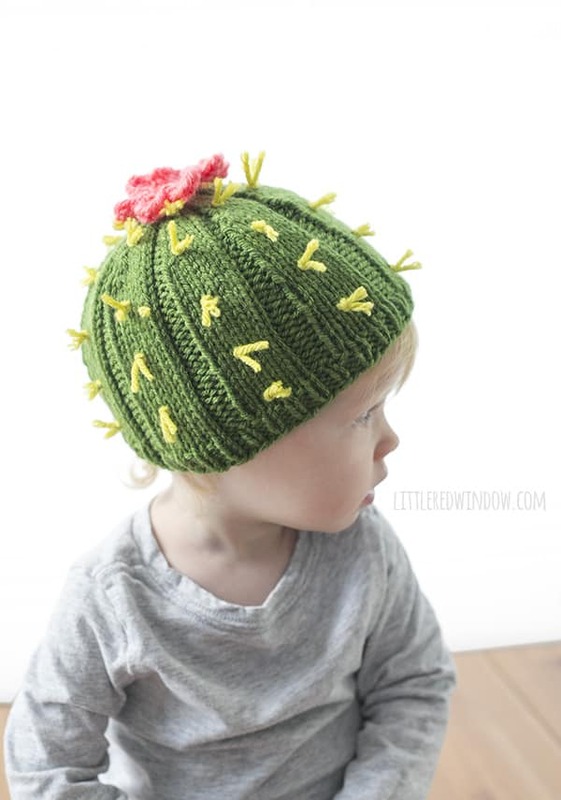 Repeat, spacing your spikes evenly around the cactus hat. Trim each spike to be about 3/4 inch long. Using straight needles and a long tail cast on, cast on 70 stitches with pink yarn. 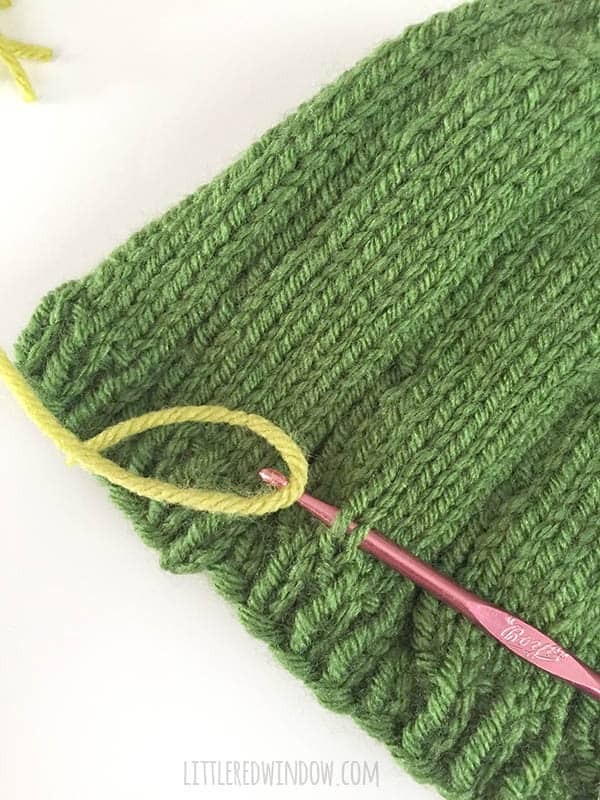 Cut the yarn leaving a long tail and thread that tail onto your yarn needle. Then thread the yarn needle through the remaining live stitches and pull to close the center of the flower. Tie a knot on the back of the flower and leave this long tail to sew the flower to the hat. 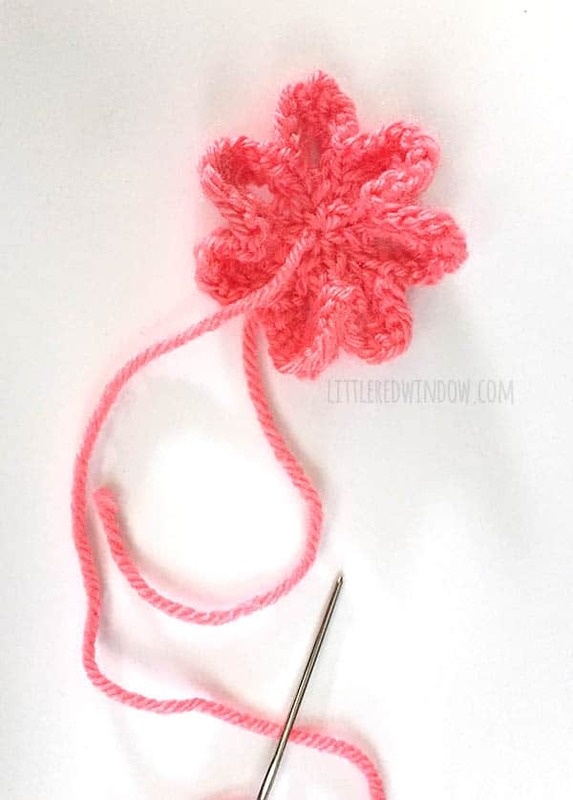 Use the original cast on tail end to stitch the first and last flower petal together to keep the flower closed. Then sew the flower to the top of the hat. 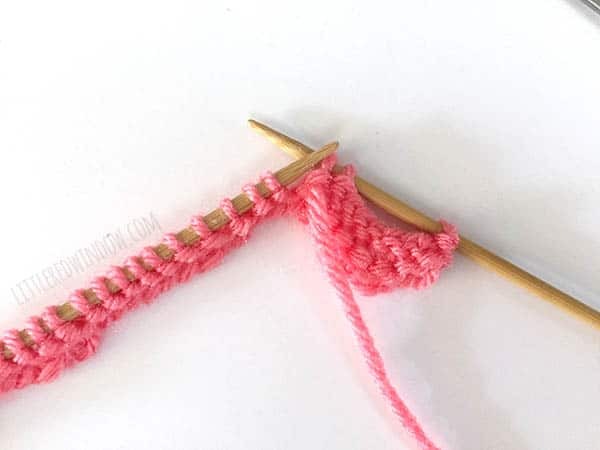 *to do a purl cast off (also known as a purl bind off), purl one stitch, then purl a second stitch and pass that second stitch over the first and off the needle. You have cast off one stitch. Continue on purling another stitch and passing the previous one over it and off the needle. And that’s it! 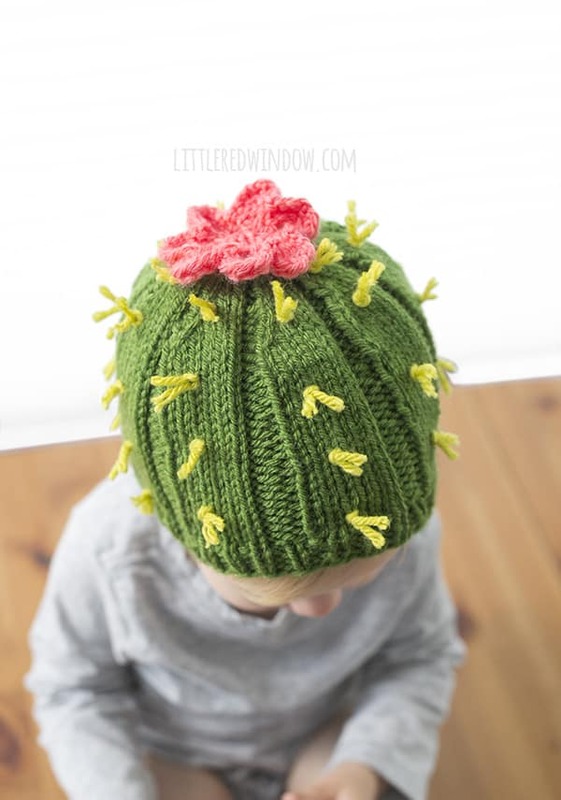 Enjoy your Cuddly Cactus Hat!